Firstly I will say again, how wonderful it is to be here, this time without the hamster dudes—shh–largely, because this time I am frying other fish, or rather peas. Being a writer of historical romance. the foods, the recipes of whatever era I’m working in are important. Yes, even the humble pea. SO straight off I am handing you to a nameless secondary character of mine, a spying serving woman from my Time Mutant Series, The Writer and The Rake. Why? Because she has quite a story about that humble delicacy—peas. AND my home city. Oh, and the general ungratefulness of the modern day heroine from that book who, being a writer had read somewhere about the endless way people stuffed their faces in Georgian times with parades of food and booze, meals that went on for hours, and was in for a big shock. ‘Frankly, good day to you all and I don’t know what is bein’ meant about this three peas business or what the mestress thought she was doin’ wrestin that spoon from my hand when all I was doin’ was countin’ them out on her plate like my real, proper, mestress, what is legally married to her husband not like some, had told me. ‘”A Belgian first brought chips to Scotland. Born in Brussels in May 1847, Edward de Gernier arrived in Dundee, Scotland, in the early 1870’s leasing a house in the city’s bustling Greenmarket. At first, he and his wife found it difficult to find work, largely due to difficulties with language but aware of the popularity of chips in his homeland, he spotted a lucrative opening in the fledgeling fast food industry. 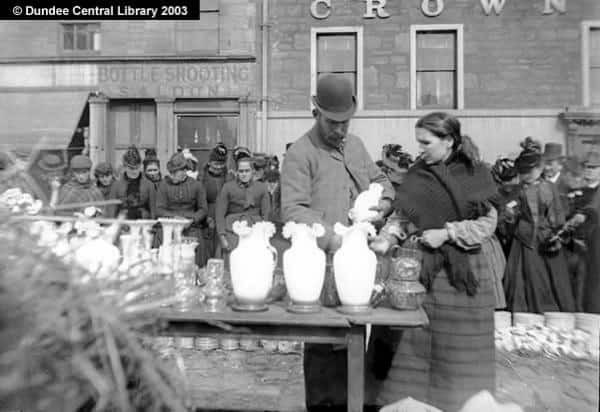 With initial capital of just three old pennies, he took a stall on the market, described by historians as a twice-weekly gathering of ‘fiddlers, pickpockets, whores, auctioneers and preachers’. So there you have it. And while I don’t have the actual bona-fide Buster recipe. I do have one for mushy peas which are probably similar. Boil a pot of lightly salted water to the boil. Add frozen peas, and cook for 3 minutes, or until tender. Drain peas, and transfer to a blender or large food processor. Add cream, butter and pepper to peas, mash till blended, but still thick with small pieces of peas. Serve—preferably over chips. Sure to keep certain folks from moanin’. 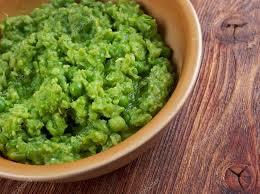 Mushy peas are so #yummo Hope you will try it again and let us know how they turned out for you. Here is a simple, yet delicious recipe with a fascinating story from delightful Shey, no doubt assisted by The Dudes. You absolutely must go visit her blog and meet The Dudes! Enjoy, Beautiful People! I enjoyed the story and the pea buster/mushy peas recipe. Thanks for your visit and comment on this awesome Guest Post. 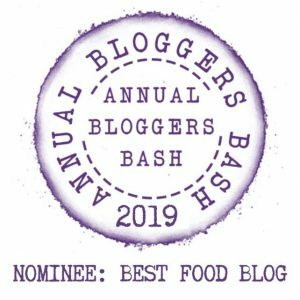 May I ask if you would be interested to also do a Guest Post here with me?? Thank you for the compliment but I have to decline. I don’t do guest posts. Hi Shey. I always learn something from you. Thanks for sharing this. I adore mushy peas, although when I have made them, it has always been with dried marrowfat peas (or the frozen variety), with a sprinkling of bicarbonate of soda to speed up the mushing process. Either way, they are delicious, with a hot meat pie, fish and chips or sausages. Just don’t tell Hamstah Dickens! Hi cookandenjoyrecipes. 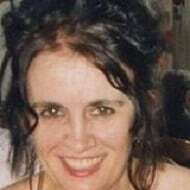 As requested, my blog link is http://www.catherinecavendish.com/ Many thanks! OOH, didn’t know that Christy. Where is he from? Might even have been there. Mushy peas are the best. When I was thinking what character to do this blog and what recipe from what book/era I remembered the story of the buster stall. It was a local institution and folks of a certain generation still talk about it. A really interesting post, Shey and Esme. I didn’t know that mushy peas had cream in them. Dash, another dish to avoid. Robbie, Maybe you can substitute the cream with a different ingredient. Shey, what do you think?